Never worry about losing your keys again with Nest x Yale Lock. This smart lock works completely without keys - to lock or unlock, simply tap a button in the app or enter a passcode. All you need to connect the keyless lock to the app is a Nest Connect or Nest Guard. The Nest Yale Lock + Nest Connect brings a secure and tamper-free smart lock for your smart home. Just with your phone, you can lock and unlock from anywhere, give access to friends and family and keep a track of visitors. Using the Google Home Hub or Mini, you can access your door with your voice. Manage your home access, from anywhere in the world. Using the Nest app, you can unlock and lock your door, create unique passcodes for trusted guests. If you’re relaxing in your bedroom, you can also lock the door using your voice with the Google assistant. The bundle also includes the Nest connect, so you don't have to spend anything extra on a hub. No keys required: The Nest Yale Lock offers an extra layer of security with the key-free deadbolt smart lock. So you never have to worry about keys getting stolen, copied or lost. Give access to family and friends, from anywhere: Within the Nest app, you can create unique passcodes for family and trusted guests to let them in from anywhere. The Nest app will notify you every time someone opens or locks the door. Single touch and auto lock: Stepping out in a hurry with your hands full? you can lock the door with a quick tap. When Nest detects you’re away, it also locks your door automatically for you. Voice assisted control: Use your voice to lock the door from anywhere and check the status, hands-free with the Google Home Hub Mini and the Google Home Mini. Get timely updates, on your phone: The Nest Yale Lock replaces your existing deadbolt and if someone tries to tamper it, you will receive an alert instantly. If the batteries are running low, the app will notify you. The setup is fairly simple and your door is secure, in a matter of minutes. The Nest Yale Lock connects to Wifi and the Nest app only through the Nest Connect. It works with a wide range of deadbolt locks and will fit standard doors. Once installation is done, you can also add it to your devices with the Google Home app to manage your smart lock with your voice. Once the Nest Yale Lock is connected to the Nest mobile app, you can use your phone to lock and unlock your door. By creating passcodes for family, you can give them access from anywhere. No more hiding keys under the doormat, they can walk into your home using their unique passcode. You’ll receive alerts whenever the door is unlocked or locked. The Nest Yale also automatically locks the door, when you’re away. Add an extra layer of security with the Nest Yale Lock and Nest Connect. You can check the door status, lock and unlock your door remotely and let in trusted guests with unique passcodes. The Google Home Hub and free Google Home Mini can be paired with the Nest bundle for a more convenient experience. Setting up the lock follows the standar procedure and can be attached to your door easily. The lock is sturdy and tamper-proof. The Google Home app gives an overview of all the connected devices in your home. Lock and unlock your door, track visitors and give access to trusted guests with unique passcodes. You can manage home access with your voice, without any delays. The key-free and secure smart lock is desgined for your home security needs. It secures your home and gives a stylish upgrade to your door. Nest values your privacy and it communicates via Weave using an encrypted connection. If you're looking for added home security and reliable voice assistance, this bundle comes at a great price. Nest Lock: 2 lb 4.2 oz. Nest Connect: 0.98 oz. Google Home Hub: 16.9 oz. Google Home Mini: 6.1 oz. Google Home Hub: Wi-Fi 802.11 b/g/n/ac (2.4 GHz/5GHz) + Bluetooth 5.0. Google Home Mini: Wi-Fi 802.11 b/g/n/ac (2.4 GHz/5GHz). If the batteries drains out when I'm not home, will I be locked out? The Nest app notifies you twice, first when the batteries are getting low and next when they are critically low. In case the batteries run out when you’re not home, you can use a 9 Volt battery to charge the lock temporarily and access the door with your passcode. 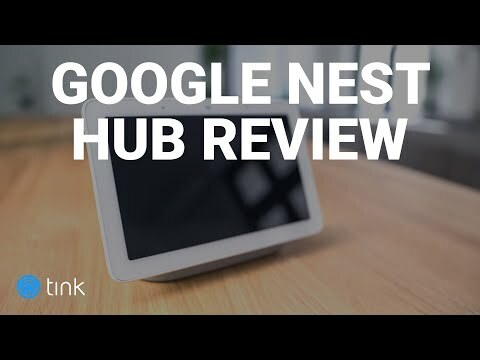 What functions can I control with the Google Home Hub and the Google Mini? Once your Nest Yale smart lock is paired with your Google voice assistants, you can lock and unlock your door and check your door status with your voice. Does the Nest Connect work with multiple smart locks? Yes. If your home has two or more Nest Yale locks, you can easily pair them using one Nest connect.